On December 6, 2010, Ruben Quinones, director of new media at Path Interactive shared insights on Making your LinkedIn Profile Pop during the Columbia Business School Alumni Club of New York social media event which took place at the Samsung Experience at Columbus Circle. The event consisted of networking, formal presentation and hands-on, one-on-one consulting for those interested in getting more nitty gritty with LinkedIn. 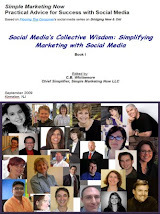 Learn how to build your profile and create connections to make the most out of LinkedIn, the world's #1 business networking site. Discover how to propel yourself to the next level by using LinkedIn, the most searched professional website. Over 15 million business professionals log on every day to look for jobs, search for potential clients, get recommendations, reconnect with former coworkers, and build their reputation as an industry or subject expert. LinkedIn now has over 70 million users, including over one million company profiles. This event is for business professionals who have wondered how to get started on LinkedIn or have started a profile, but then wondered what to do with it beyond filling in the form basics. We will start with an introductory presentation and Q & A by Ruben Quinones, Sales and Social Media, Path Interactive. In a short amount of time, Ruben has caught the attention of the online marketing community as an enthusiast, teacher, speaker and personal brander. Ruben consults with brands on their SEO, SEM, and social campaign strategy, and is an Adjunct Professor at New York University teaching SEO and Social Media. He is also Speaker, Lecturer for Digital/Social/New Media at Path Interactive as well as their Director of Sales and Social Media Marketing. After the presentation, several hands-on social media advisors from the Club will be available to walk you through the LinkedIn site and answer questions, using the computer terminals at Samsung. Amy Vernon, Director of Viral Marketing Strategies, BlueGlass Interactive Inc.
Our thanks to Cecilia Pineda Feret ‘92 and Mary Reilly ‘93 for organizing this event. Thank you to Samsung and Sobel Media for sponsoring our event and hosting us at their wonderful showroom space, which offers several Samsung computer terminals for our hands-on instruction. Google controls your message/reputation online: Dec to Jan 2009, Ruben got 44 visits from LinkedIn. That caught his attention and he started experimenting to determine which factors affected the LinkedIn search algorithm. Your positioning in LinkedIn is influenced by your connections and the keywords in your profile. If you want to come up higher in search results, it helps to connect with others. Add keywords to your professional headline and your current & past position titles. Ruben's professional headline reads: "NYC Online Marketing, SEO, PPC, Digital Marketing, Social Media Marketing, Online Branding, Speaker, Blogger, NYU Adj." He recommends adding NYC. Notice that the headline is about selling solutions rather than listing a position title that only makes sense to you. The summary has no bearing on the LinkedIn search algorithm. However, that's where you tell your story. Specialties matter, as do Interests. That's where you should jam keywords in! Add applications to make your profile pop: feed from your blog, presentations you've done. Ruben has added video using Google presentation. Consider status updates an opportunity for conversation with your network. Make the information you post beneficial to your audience. Try to get one recommendation per position. Recommendations factor into your overall positioning for search results. Be sure to use LinkedIn as a research tool, to connect and converse with contacts within industries. Groups and Answers represent ways for demonstrating knowledge. Google indexes answers; they help your Google-ability [a.k.a., Google Juice]. Explore using LinkedIn search; see what kinds of professional headlines come up when you enter your search terms. Who ranks first? Where do those search terms appear in those results? Think like Google. Mention your key words many times throughout your profile to improve your ranking. Note how Ruben has broken his current position into three separate positions to highlight specific keywords. STATS? If you have premium account on LinkedIn. Preferably do status updates from the LinkedIn application itself versus using #in from Twitter so you can include pix or video and - more importantly - customize the message for your audience. 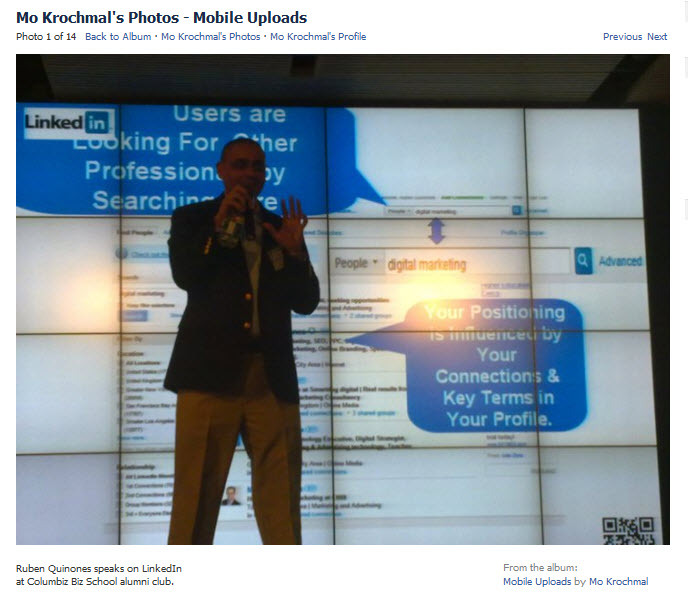 Ruben Quinones suggests checking out his LinkedIn Tips. 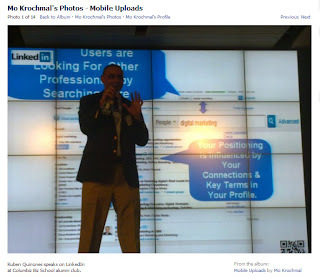 Mo Krochmal points us to Leveraging LinkedIn. I recommend How Do I Make the Most of LinkedIn [to which I will be adding a link to this post]. I had a blast being part of the Hands On Social Media Advisory Group for the Making Your LinkedIn Profile Pop event and really enjoyed the questions that came up. So much so that Cecilia had to chase me out of Samsung Experience! If you're in NYC for the next CBSAC/NY Social Media event, I recommend that you come. You're guaranteed good conversation! Check out the first event in the Social Media for Business series: Social Media for Business & Entrepreneurship - CBSAC/NY Panel Discussion which took place in June 2010. Image Credit: Thanks, Mo Krochmal! Wishing You The Best For the Holidays! How Do I : Twitter Chat?